A black and white negative of Gordon Osborne taken on February 23, 1938. In this view Mr. Osborne is sitting in a chair with his arms on the arm rests and is looking at the photographer. Gordon Osborne was born at St. Thomas on 2 August 1912. He came to Whitby in 1937 by way of Kingston as the manager of the Agnew Surpass Shoe Store. In 1939, he became Oshawa District Manager of the Empire Life Insurance Company and in 1950 he opened a real estate business in Whitby. Osborne was a Town Councillor in 1945 and member of the Board of Education in 1946-1947. 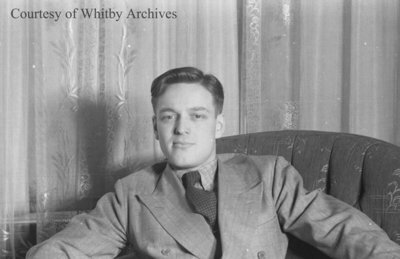 He acted as secretary for the Whitby Chamber of Commerce in the 1940s and was Whitby's first part-time Industrial Commissioner from 1951 to 1952. From 1949 to 1953, Osborne was head of the Whitby Swimming Pool Campaign which oversaw the construction of the outdoor pool in Kinsmen Park. He also taught Sunday School at Whitby Baptist Church for more than 20 years. Osborne was very active in community services groups including Whitby Kiwanis Club and the Whitby branch of the Canadian Red Cross Society. Osborne moved to Oshawa by 1960 and died there on 1 September 2002. He is buried in Mount Lawn Cemetery. Gordon Osborne, February 23, 1938, Marjorie Ruddy. Whitby Archives A2013_040_708B.